Steel Shelving Experts | Iowa Illinois Warehouse Services, Inc.
Iowa Illinois Warehouse Services, Inc. is an established company specializing in the design and installation of quality warehouse equipment and steel shelving storage systems. Our management team has over forty years of experience in the warehouse service industry and is prepared to provide you, our customers, the quality design and installation services you deserve. Our highly qualified field service teams have extensive experience in all types of pallet rack installation, catwalk system installation, mezzanine installation, and VRC (vertical reciprocating conveyor) or freight elevator installations as well as removal or relocation of existing industrial shelving systems. We have extensive experience in design work and in helping our customers get the best possible usage of every square foot of warehouse space they have in their facilities. Our facility in the western Chicago Metropolitan area includes a stock of used and new pallet rack systems components as well as a fabrication shop for your small, custom designed parts and supplies. We also have a service department capable of providing maintenance to your warehouse systems including emergency repairs. Our customers are our friends - we strive to build long term relationships and are available to answer your questions at any time. Our teams work nationwide and our relationships with quality manufacturers and other experts make it possible for us to provide you with solutions to your every warehouse issue, small or large. 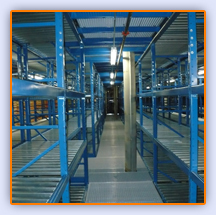 Whether you need complex industrial shelving, a simple pallet rack, or a warehouse-wide installation of steel shelving, we have the products and services for you. 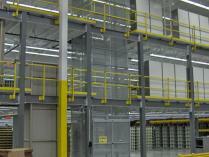 Steel Shelving Pros—Iowa Illinois Warehouse Services, Inc.
CIP specializes in manufacturing lifts for any lifting need. In addition to large lifts, CIP produces standard lifts for the smaller needs, such as: storing automotive parts or tires on an upper level for better space utilization; moving office supplies, boxes, and files safely; lifting parts from a storage area in manufacturing facilities; retrieving inventory in upper level stock rooms for retail stores. IIWS TEAMS UP WITH CIP! IIWS has become a full service dealer for Custom Industrial Products and now offers a full line of Custom material lifts. 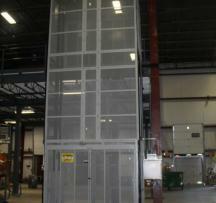 Watch for our site upgrade with a new page devoted to material lifts! Copyright 2010 Iowa Illinois Warehouse Services, Inc.: Steel Shelving. All Rights Reserved.